I remember writing in my Make-Up Addict tag that my one thing that I really wanted was Zoeva Brushes, after Zoe featured them in her videos I was intrigued to seeing what all the hype was. My friend Keira(keirabowman.co.uk) then ordered the Rose Gold Smokey Shader brush off Depop for me and I absolutely loved it. So much to my delight Keira surprised me and bought me a set for my birthday as you can tell I LOVED them. The are all so soft and great quality. 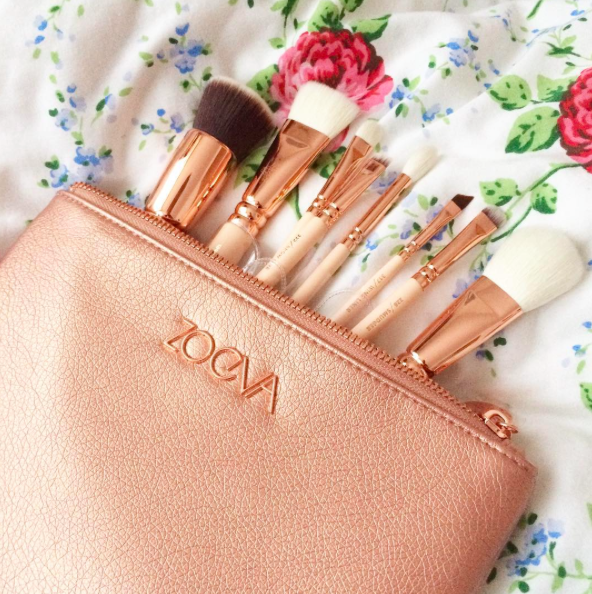 After being told about http://www.blushbeautyundefined.com from Keira, I had a quick look on the website and the thing that really caught my eye was the Zoeva Brushes. I purchased the Rose Golden Luxury Volume 2 set. I ordered them on a whim whilst jet lag hit in America and I am so glad I did. They came with this gorgeous Rose Gold Make-Up up which I use for my everyday make-up. Every single brush is just perfect, the set came with 8 rose coloured brushes, not to go into much detail about each but I have got a top 4. 1. 228 Luxe Crease, I already had one but I find it perfect to have multiple. I use this for lighter shade. It is so soft as it blends perfectly. 2. 234 Luxe Smokey Shader, like I mention I already have this but again I use it for lighter shades partially for highlight under my brow. 3. 103 Luxe Face Paint, I didn't know that I needed this until I used it. It is my lifesaver for contour, it is perfect to get under the cheek bones and make the stand out. I love how short the brush is as it make it super easy to hold and move on the face. I can't get enough of it and would highly recommend it. 4. 126 Luxe Cheek Finish, lastly this brush has really help me with highlight. I never had a particular brush for my highlight so it is great to own one. I really love how easy it is to apply my highlight and I love how lovely it makes my cheekbones look. Overall I absolutely adore these brushes, they are super great quality, so soft and beautiful. I want to thank Blushbeauty for sending them after the first set got lost in the post. Great service and I would highly recommend checking her website. Hope everyone is doing fab.